In the Dominican Republic, the first decade of the 20th century was characterized by constant political turmoil. In between wars and revolutions, Dominicans found plenty of ways to amuse themselves. Excursions to the countryside were common, as were Sunday concerts in the park. Literary and philanthropic societies, some of which were hosted by the country’s numerous masonic lodges, had been popular with Dominicans of all kinds since the 1800s. As the 19th century came to a close, the upper classes began to gather in recreation clubs. By the last decade of the 19th century, nearly every city and large town in the Dominican Republic possessed its own high society club. 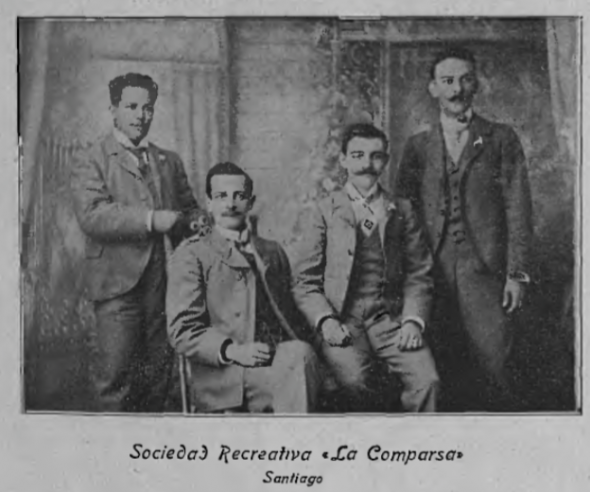 Members of Recreational Society “La Comparsa,” one of the recreational clubs established in Santiago de los Caballeros. Courtesy of La Republica Dominicana. Directorio y Guia General. 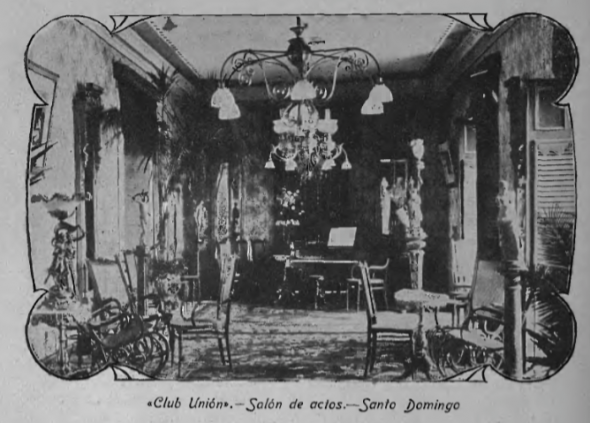 El Club Unión, established in Santo Domingo in 1892, was considered “the select social centre of the best Dominican Society.” The club was administered by a “carefully selected” Board of Governors made up of men from prominent Dominican families. P.A. 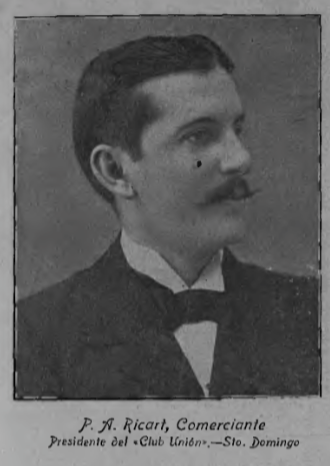 Ricart, President of Club Union of Santo Domingo in 1906. Courtesy of La Republica Dominicana. Directorio y Guia General. 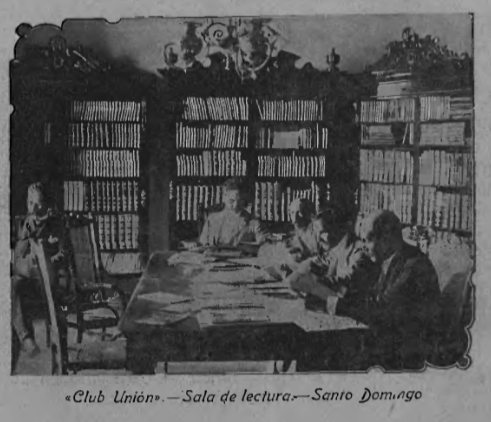 Reading room of the Club Union in 1906. Courtesy of La Republica Dominicana. Directorio y Guia General. Assembly hall of the Club Union in 1906. Courtesy of La Republica Dominicana. Directorio y Guia General. Recreation room of the Club Union in 1906. Courtesy of La Republica Dominicana. Directorio y Guia General. Gathering “the best of Santiago society,” El Recreo organized monthly dances, as well as piano, violin and flute concerts and soirees, their name for literary evenings that included speeches, poetry and music. Prominent national and international figures attended the club’s events—notable guests include Jose Marti, Cuban national hero, the esteemed Puerto Rican professor Eugenio Maria de Hostos and Ramon Albors, a professor at the Conservatoire de Paris who delighted the club members with a concert in 1897. 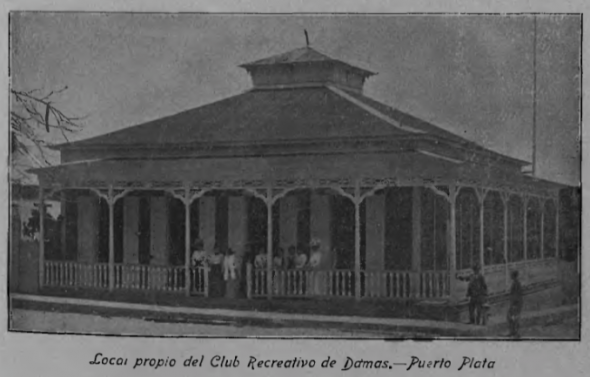 El Club Recreativo de Damas, established in the town of Puerto Plata, is credited in 1906 as having initiated a movement towards the integration of Dominican women in the country’s artistic scene. Headquarters of Club Recreative de Damas in Puerto Plata. Courtesy of La Republica Dominicana. Directorio y Guia General. 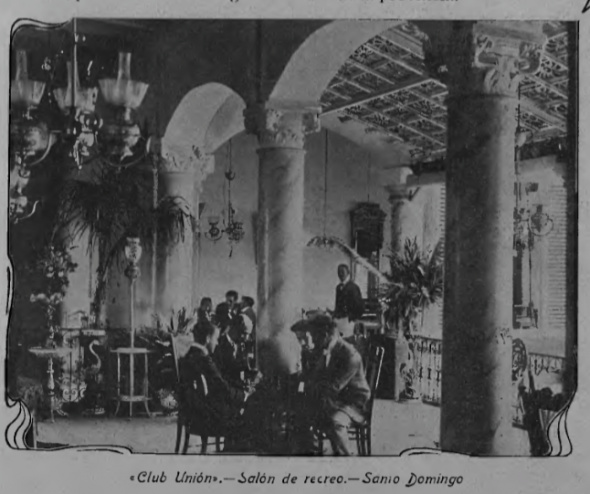 Another such club was the Casino de la Juventud in the city of Santo Domingo. Its members organized “reinados”, where young society women were crowned as queens during dances. There was no particular season designated for balls and dances, which were held year round. 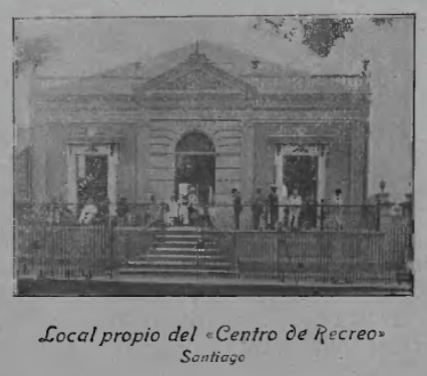 In his Directorio y Guia, published in 1907, Enrique Deschamps, president and founding member of Centro de Recreo, boasts that as many dances were held in the cooler months of January and February as in July and August. Clubs always held dances on Christmas Eve and “delicious parties” for the younger set on Christmas day. Dances would start at ten and would go on until three in the morning—and often even later! These dances were lavishly described in the illustrated magazines of the time. Reports always included the names of the young ladies and matrons in attendance, along with opulent descriptions of their charms. Aside from recreation, one of the main purposes of these clubs was to promote the intellectual growth and edification of its members. Most clubs had their own small libraries with books imported from Europe and North and South America. Members would frequently gather to play chess together, have lectures and discussions, and some clubs would go on to publish newspapers or magazines for the general public. In my next post, I’ll continue with some more amusements enjoyed by Dominicans in the Edwardian Era. Compañia Biografica. (1920) Libro Azul de Santo Domingo. New York City, N.Y: Klebold Press. Deschamps, E. (1907) La Republica Dominicana. Directorio y Guia General. Santiago de los Caballeros, Dominican Republic. Espinal Hernandez, E. (2005) Historia Social de Santiago de los Caballeros. 1863-1900. Santo Domingo, Dominican Republic.